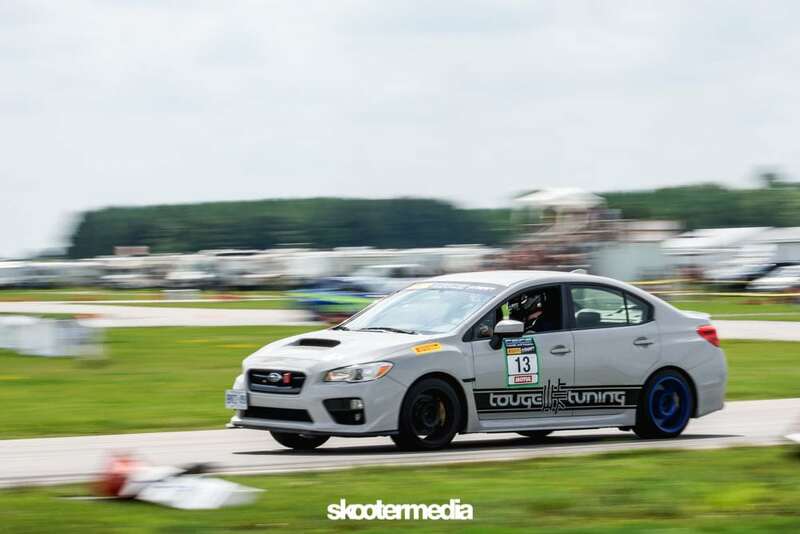 Project Northstar – CSCS Time Attack Round 4 – Underdog to Upset? Well it’s -7 Celcius here in Mississauga today, the exact opposite of the weather back in August of this year when it was 29 Celcius in Grand Bend for Round 4. Some of you might be wondering what happened to Round 3 of the 2016 season. Well for unknown reasons iCar in Mirabel Quebec decided to give up the pre-booked event date to a corporate client. The majority of competitors already had accommodations booked and time off work so this was a really big annoyance for most. This also meant the series was cut down from 5 rounds to 4 as an alternative date could not be found in the middle of the year. TSK TSK iCar! 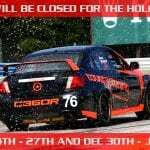 While I was looking forward to running at iCar again it was time to look forward and start planning for Round 4 at Grand Bend Motorplex in Grand Bend, Ontario. 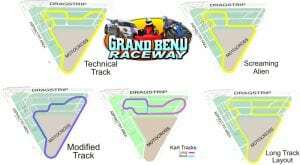 Grand Bend is an awesome place to go racing in my opinion. I raced here for 2 years in amateur motorcycle road racing with SOAR and really like the area. The town sits on the shores of Lake Huron and is really busting at the seams in the summer. You can have a great day at the track and head into town for a dinner or to the beach for a swim. I would love to see more events here as it is very appealing despite being around 2.5 hours away. Because of the busy summer season we chose to stay in London, Ontario which is around 20-30 minutes away and offers more options for getting a good nights rest. I know some will not think it’s important but I value a good nights rest above all else when it comes to racing. 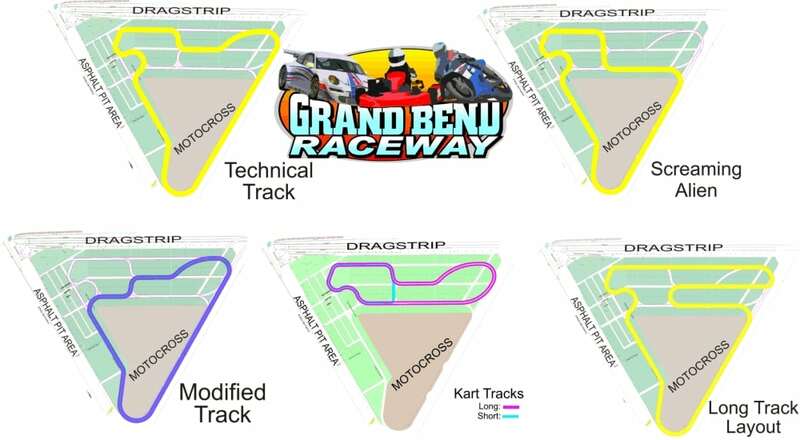 One of the nice things about Grand Bend Motorplex is the number of configurations they have for the track layout. There’s 5 different layouts which allow you to change what kind of set-up will have an advantage over another. 3 of the 5 layouts definitely benefit high power as they use the extremely long back straight. This meant for me that my already underpowered set-up would be even more handicapped at arguably the fastest track of the season. When the round was initially announced it was scheduled to be run on the Modified Layout, which was run 2 years ago. As you’ll see below the Modified layout has a very simple right-left-right-left in-field section leading to the super long back straight, right hand fast carousel and then the final fast left back to the start/finish line. This was probably the worst layout for my car but that’s racing! At the last minute before the event CSCS decided to switch it up and run the Technical Track which is probably the most balanced layout giving lower powered cars a better shot at making up time in the infield. This was a bit of a surprise and definitely gave me a glimmer of hope! 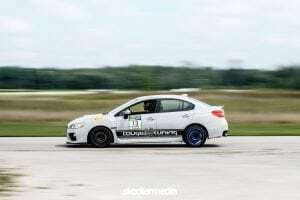 At this point I was tied for first overall in Street AWD with 1 win and 1 second place. 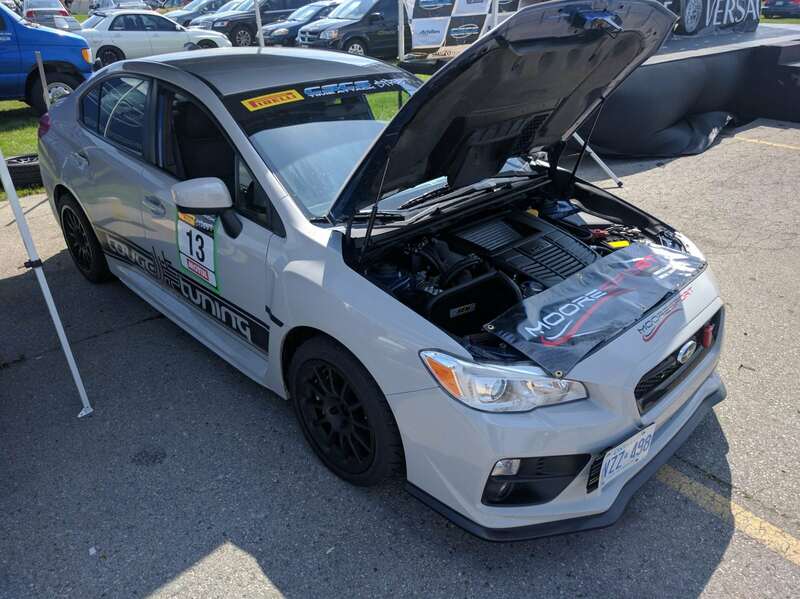 To be honest I was simply hoping for a podium result at Grand Bend as I knew that many of the other cars, including our own, were much faster than mine in terms of outright power. The only advantage I had was that I knew the layout and some of the track secrets that you learn competing at the same place multiple times. We arrived around 930am and set-up the pit area for the cars so we could swap wheels and make sure the cars were working well. A testament to my guys is that the whole season not one of our 3+ cars competing has had a mechanical failure or anything of the sort. With the number of entries overall a little down for this round CSCS ran 2 run groups meaning lots of track time and also a good amount of time in between runs. I actually prefer fewer but longer sessions as it gives you the chance to work on the cars in between or just let them cool down properly. 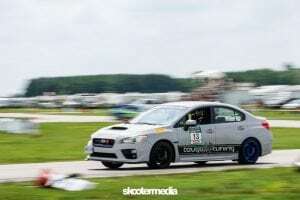 The experience advantage seemed to be working right out of the gate as I was immediately second quickest for Street AWD which again had the largest number of entries at 12 competitors. 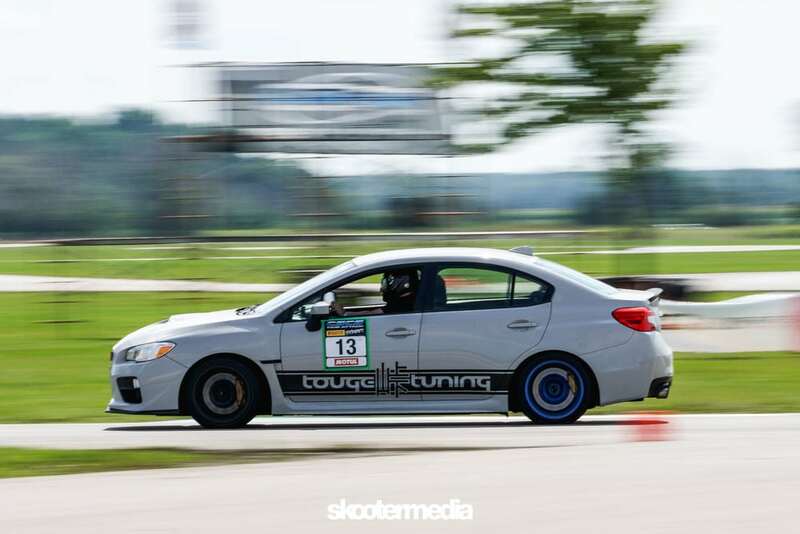 Unfortunately for me Ryan and his RHD GC STi were sitting in first pretty much all day around half a second ahead of my best time. I continued to shave off time and he would go faster which made me feel like he had a decent amount of time left in the bag. Due to the heat I actually skipped a session or 2 to let the car cool and keep the fuel level at a good amount for the final time attack session. While waiting for the final session we noticed that the RE71R tires were wearing on the drivers front outer edge pretty aggressively. This is likely a combination of the really hot temperatures combined with the long right hand infield section putting a lot of stress on the front left. The tires were actually so bad that we knew the tires would be useless after this event so I had to try and extract all that was left. Going into the time attack session I was pretty confident I could do a low 1:13 which is where I qualified but beyond this the factors were stacked against me. 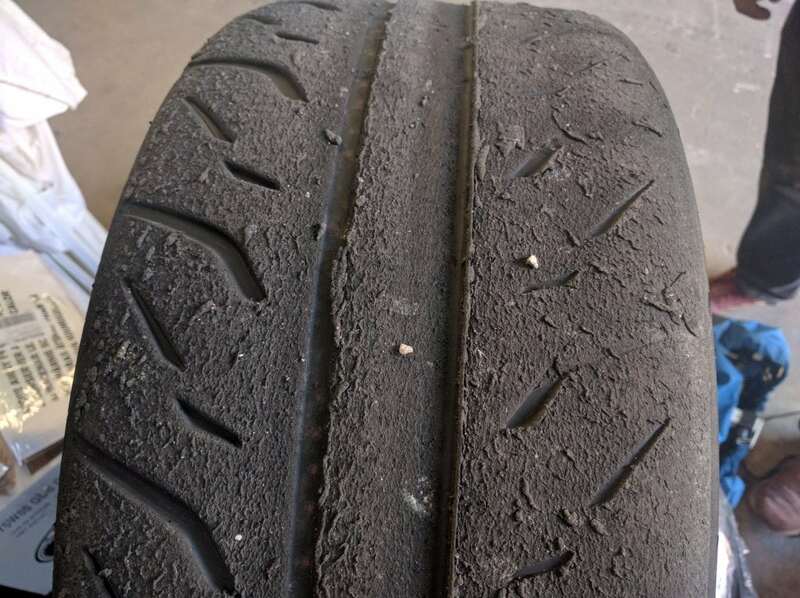 Hot temps and worn tires are not a combination for turning a fast lap. I was lined up behind Ryan which was getting far too familiar at this point! We had quite a long wait for our time out as the class ahead of ours ended up having the slowest qualifier interfere with the fastest qualifier so instead of doing 5 laps they did something around 7 or 8. The marshalls finally waived us on track with around 10 seconds gap between myself and Ryan. 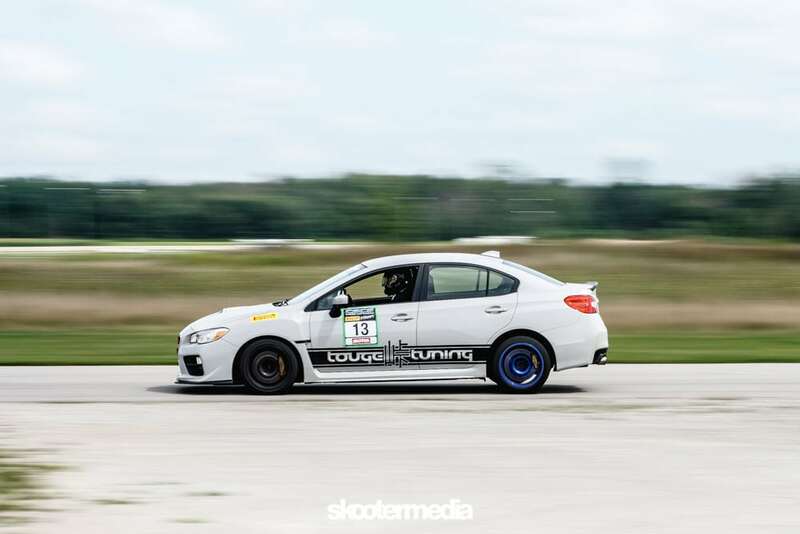 As always I really try to focus on keeping the car cool on the out lap until the last section where I will try and get the brakes and tires slowly up to temperature. Coming around the long carousel I made sure to position myself for a fast entrance into the left kink heading to the start line. Lap one seemed to go well although I never felt like the car was as fast as it could be in the infield section. The long back straight gave me time to do the usual helmet adjustment, belt check and also allowed me to tap the brakes to get the pads back up against the rotor face as pad knockback was an issue for me all day. I got a great run around the carousel and was very fast through the left kink which has a little bump that your left wheels hit if you cut it aggressively. Luckily the stock suspension absorbs bumps well and the car didn’t get out of shape and just took it like a champ. I crossed the line of the first lap and on the AIM Solo DL I saw 1:12.56! It was hard to control my excitement as this was the first time for me in the 12’s but I still had 2 more laps to go! I continued to push on the second lap and crossing the line saw a 1:12.34, even faster and pretty much a full second faster then I had qualified. So much for me not having faith in my little WRX, she clearly wanted to go fast. Last lap I pushed even further and just tried to keep the infield section clean and smooth and brake a little deeper at the end of the back straight. Crossing the line the AIM screen flashed a 1:12.32 which was my fastest lap of the day. On the cool down lap I was so happy with how I had driven I was even talking to myself. I uttered something to the effect of it didn’t matter where I finished as that was probably the best driving I had ever done. It may not seem important to some but being able to put down 3 laps in a row within 2 tenths of a second with such a simple car is an accomplishment in my books. As we pulled off track to exchange our transponders for our drivers licenses and credit cards I was getting nervous. Did I even make the podium? How did Ryan do ahead of me? How much did I lose by? All those questions were answered when the CSCS official told me to head to the P1 spot! I couldn’t even believe it I had to ask them again to be sure. Sure enough I had somehow pulled out another win and also another class track record. This put me back in first place overall for Street AWD and meant it would come down to the final round to see if I could continue to stay at the sharp end of things. 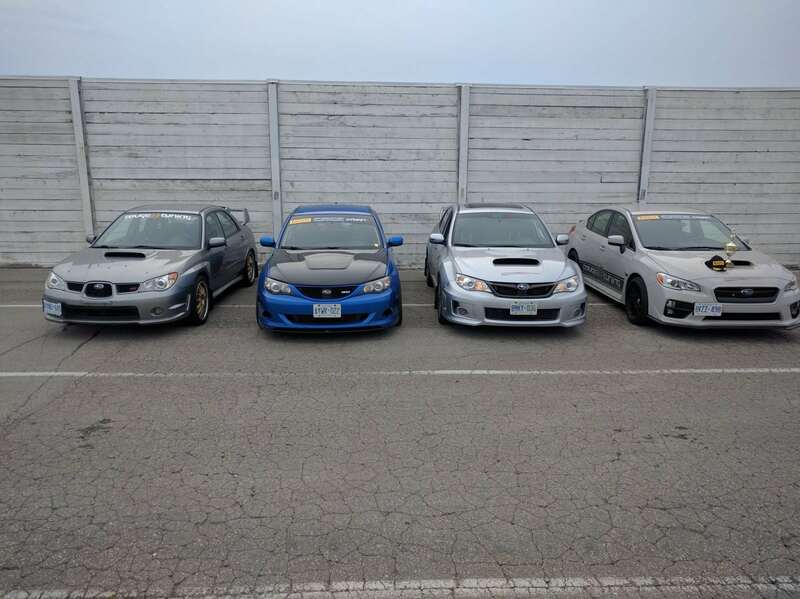 Our 3 cars did amazing and I can’t stress enough how much fun it is to be able to share these events with great friends! Round 4 didn’t end without a little bit of carnage. Below you’ll see an image of the Bridgestone RE-71R tires at the end of the day. 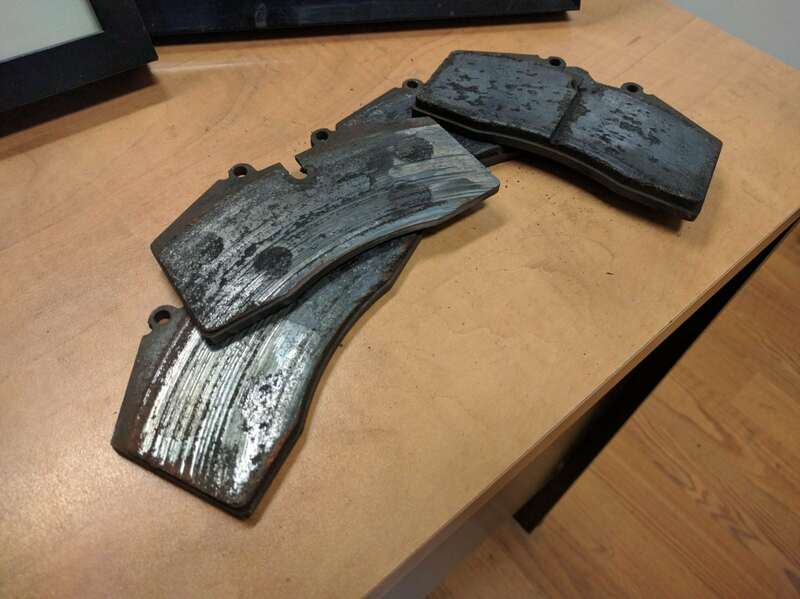 You’ll also see the front brake pads which were actually worn to the backing plates just as we pulled into the Mississauga area at the end of the drive back. Thankfully nothing was damaged and the pads still had enough life left to get me the win! 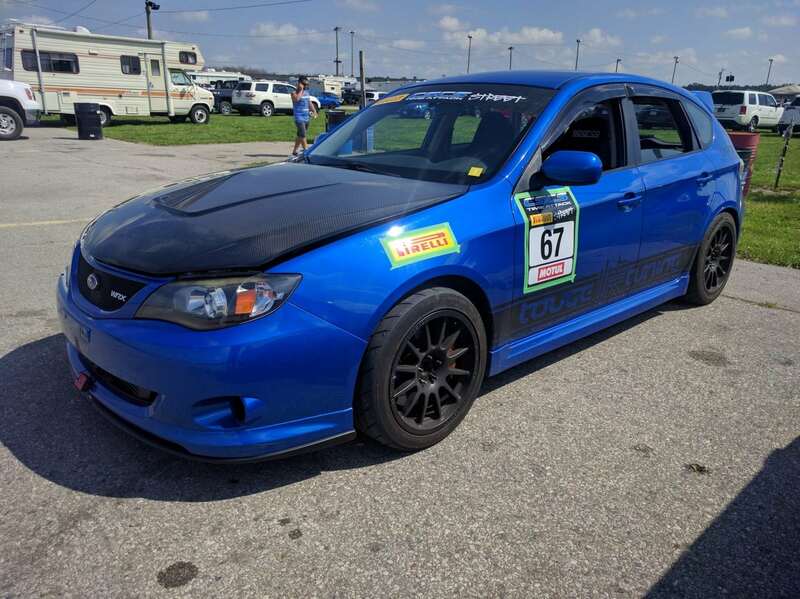 Having just bought one of your clients cars (07 STi) I’ve been looking for a supplier for parts. Seeing as though you’re a race on Sunday, sell on Monday type I know I’ve found the right place. It gives me great confidence knowing if I need advice I’ll be getting the right answer from you. Congrats on your TA success! I’ve competed in a number of TAs at my home track with a number of FTDs and class wins so I know how good it feels. 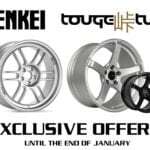 You’ll be hearing from me soon for some orders. Congrats on the car Rob and thanks for the kind words. We’re definitely a Race on Sunday, Sell on Monday company. We believe in having as much first hand knowledge as we can with the products we sell. This is an awesome read! Congrats dude! does this car have any cooling mods? what kinda coolant and/or oil temps are you guys seeing on track? No cooling mods at this time, water with Mocool in the summer.